The next iteration of Internet Explorer web browser, IE9 (Internet Explorer 9), has finally been officially released by Microsoft after its public beta and RC. The RTW (Release to Web) version of IE9 is equivalent to final and stable RTM version, and it has the build version number of 9.00.8112.16421.110308-0330, indicating it’s compiled, finalized and signed off on March 8, 2011. Streamlined design with compact user interface. Pinned Sites for accessing frequently visited web pages directly from the taskbar on Windows 7 desktop. Download Manager with ability to pause and restart a download. Enhanced tabs browsing with ability to tear-off tabs out of Internet Explorer to open the tab’s webpage in a new window, and snap tabs for side-by-side viewing. New Tab page with listing of most often and frequently visited webpages. Search in the address bar with search suggestions support. Notification Bar appears at the bottom of Internet Explorer. GPU hardware acceleration to speed up graphics-heavy tasks like video streaming or online gaming. Tracking Protection to limit the browser’s communication with certain websites to help keep information private. 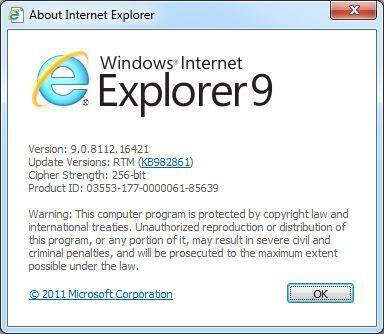 IE9 is not supported on Windows XP, and hence not available for Windows XP. Installing IE9 on Windows Vista or Windows 7 will automatically replace and remove the existing installation of IE7, IE8, IE9 Beta or IE9 RC. IE9 and IE8 or IE7 does not co-exist concurrently. So, for users who want to use IE7 or IE8, do not upgrade to IE9. An alternative is to make available another PC or virtual machine just to run IE7 or IE8. Uninstall IE9 should automatically rollback to IE7 or IE8. IE9 is available in both 32-bit (x86) and 64-bit (x64) versions. However, 64-bit edition can only be installed on 64-bit operating system. IE9 i available for Windows Vista SP2, Windows 7 (SP1 optional), Windows Server 2008 SP2 and Windows Server 2008 R2 (SP1 optional). System requirements: Computer with a 1 gigahertz (GHz) 32-bit (x86) or 64-bit (x64) processor, 512 MB RAM, 70 MB (for 32-bit Windows client OS) or 120 MB (for 64-bit Windows client OS) and 150 MB (for 32-bit Windows server OS) or 200 MB (for 64-bit Windows server OS) hard disk space, and super VGA (800 x 600) or higher-resolution monitor with 256 colors. The final stable version of IE9 can be downloaded from official IE site, beautyoftheweb.com or Microsoft Download Center. The web pages appears not been updated yet, but the official direct download links to the setup installers of IE9 final stable RTW/RTM version have been leaked. Just use the following direct download links to download full version standalone offline setup installers of IE9. All other languages can be downloaded from microsoft.com.